Which Air Filter is Best for Smoke? Planning on installing an air conditioner this year? Before you do, you might want to add “zone control” to that installation. Retrofitting an existing ductwork system with zone control is not an easy task, so we want to inform you of this option before the installation. But even if you do have a ductwork system in place already, that doesn’t mean you can’t opt for another form of zone control. We’ll explain everything down below. No more wasting money by heating or cooling empty rooms. Everyone can be comfortable according to their own preferences. Get rid of hot and cold spots—those areas that normally refuse to heat up or cool down. A normal ducted air system doesn’t allow for this level of control, using an “all-or-nothing” approach to treat your home’s air. If you’re starting fresh and have never had AC or ductwork, it’s the perfect time to go with a zone control system. 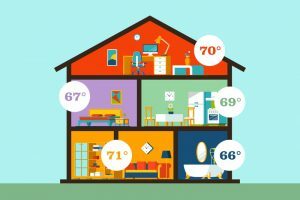 Multiple thermostats—one for each temperature controlled “zone” of your home. Electronic dampers, which are installed in the ducts and help direct airflow. Since the system is installed with the central ductwork, your zone control system will work the same for any current or future HVAC units, including air conditioners, furnaces, or heat pumps. Ductless mini-splits are a type of heat pump that consists of multiple indoor air handlers. One air handler is installed in each room that you plan to cool or heat. They all include their own set of temperature controls. Using ductless heat pumps to achieve zone control is a highly-effective workaround. You’ll be able to achieve all the same benefits you could with a normal zone control system, with the addition of not needing to care and maintain for the ductwork. After all, ducts will need to be repaired and maintained periodically. Determining which zone control option makes the most sense for you is largely going to be about costs and the size of your home. For example, a home that’s too small is not going to benefit much from a ducted zone control system—there’s just not enough space to justify this kind of zoning. In that case, a ductless system might be better and more cost-effective at achieving the results you need. Every situation is different, so it counts to consult with an expert of air conditioning services in Long Beach, CA. They’ll be able to assess your home, your needs, and come to a conclusion about what kind of system will work best for you. Contact Greenleaf Heating & Cooling today to request an estimate.